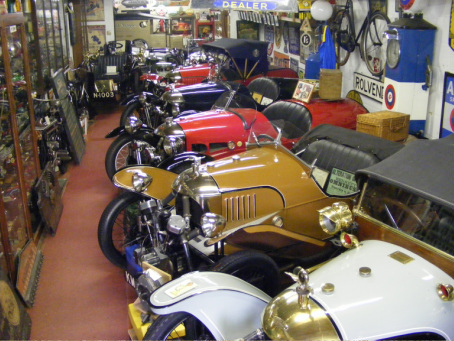 Morgan 3 Wheelers are the main feature of the collection and a particular interest of Mr Booth. The first car was constructed by Malvern Link Garage owner H.F.S Morgan in 1909. The Design is remarkably simple with nothing surplus to requirements. The backbone of the chassis encloses the prop-shaft, the lower frame tubes on some models are used as exhaust pipes, the steering pins form part of the famed Morgan sliding pillar independent front suspension. Various engines have been fitted J.A.P .- M.A.G - Anzani - Blackburne - Matchless - Ford and Precision can be seen in the collection. The Morgan Motor Company is still in existence making a range of 4 and 3 wheeled sports-cars.